I had colored the image from Inky Impressions with my new Chameleon markers a while ago. I thought I was ahead of myself in having my challenge commitments done. The image was but not the card. LOL. This is for the DT over at Give a Crafter a Cookie. The butterfly frame is from the Silhouette store. 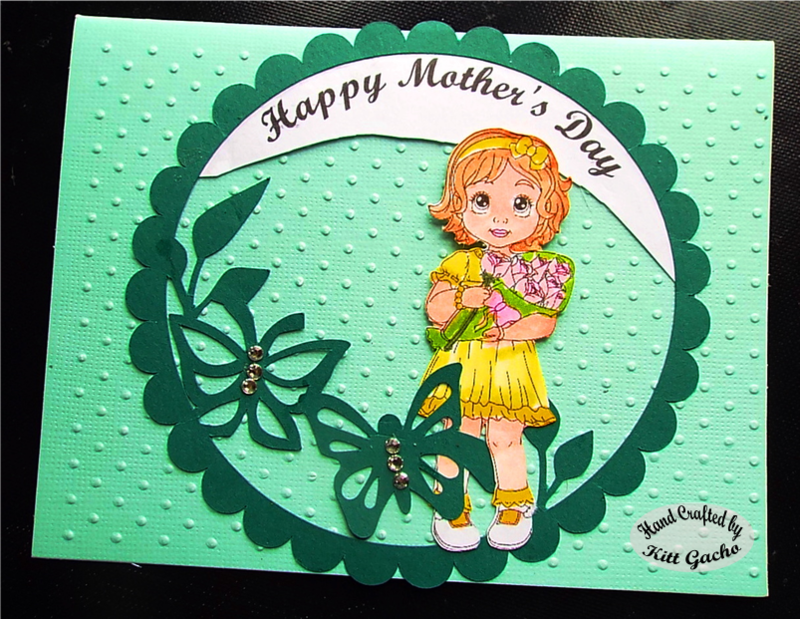 I used Cricut Swiss Dots embossing folder for the base card. To give it some bling I used Stampin Up rhinestones on the butterflies. I printed and cut the sentiment and frame with the Silhouette Cameo. Thanks for stopping by today and leaving your comments. I love reading them. Have a happy crafty day. Awww such a cute and gorgeous card, great colouring skills too. Great card, but to enter the Tiddly Inks challenge you need to use a Tiddly Inks image. What a beautiful card! I love all the intricacies and details. Thank you for joining us in the Through The Craft Room Door challenge this week.